Horse-drawn carriage rides commonly involve a fee, or a monetary exchange, of some kind. Therefore, they are placed in the “business” category. Most forms of homeowners or farmowners insurance exclude the provision of business or commercial services without additional coverages. 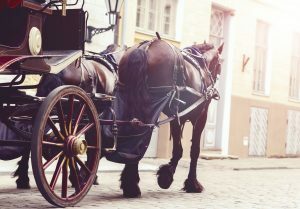 This means that, depending on the type of policy you have, your horse and carriage may be excluded from your insurance coverage unless it is specifically stated within your policy. If you have a horse and carriage operation, specialized coverage is essential to ensure that no matter what happens, you will be covered. While horse and carriage accidents don’t appear on the news very often, they do occur fairly regularly. Some of the various results include horse injuries, carriage damages, pedestrian injuries, and property damages. These are all legitimate concerns of the daily operation of a horse-drawn carriage. Even a small injury, such as running over the foot of a passerby, can quickly turn into thousands of dollars in damages. If a horse becomes injured, they may need veterinary care. Without equine mortality insurance with a major medical endorsement, those bills will not be covered. Making sure your drivers are careful is only part of the battle – other drivers on the road are a variable you can’t always control. Having a damaged carriage can put you out of operation for days or weeks. Even if you have a backup carriage, the cost of repairs can be extraordinary. Securing an inland marine insurance policy to cover such losses can be crucial in keeping your horse and carriage business intact and running successfully. To get a free quote from a company that specializes in horse and carriage insurance, contact Ruhl Insurance at 717-665-2283 today!